Are you currently playing pretty fast and loose with your Facebook privacy options? Probably! Against our best judgement, must of us do at some point or another, whether it's an unwise public status or an embarrassing profile picture. We just hope you're at peace with those choices; now, those poorly thought out public tidbits could be viewable long after you're gone. Ever since Facebook became our default phonebook, photo album, and means of communication in general, it's grappled with how to handle users' profile pages post-death. It seemed to have found a relatively comfortable middle ground with friends-only memorialized pages, but as with everything else in life, Facebook wasn't satisfied. Your family members can still choose to have your page memorialized, but once they do, those privacy settings are staying in death exactly as they were in life. These general changes were prompted by an issue that accompanied the introduction of Look Back videos. A father wanted to see the video for his deceased son, which soon prompted others in similar situations to put in the same requests. 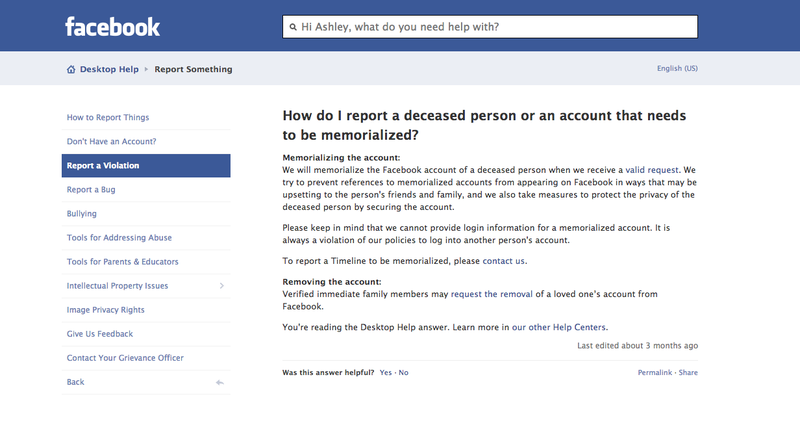 So it makes sense that Facebook might want to make it easier for grievers who might not have been friends with the deceased on Facebook. Still, it's hard not to feel uncomfortable considering that, even though memorializing a page requires the bereaved family members to opt in, it's not really being done with your consent (unless explicitly requested by a living will).